Local legend, Tosh Berman, tells us what it’s like to live with a famous, iconic father. This book is really about the art/Beat scene in LA in the 60’s. And a love story between father and son. A must read. 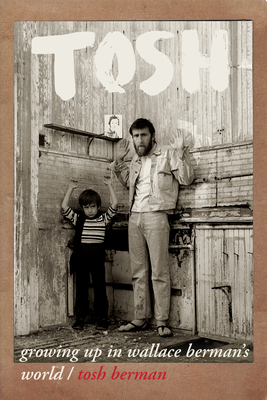 Tosh's unconventional childhood and peculiar journey to adulthood features an array of famous characters, from George Herms and Marcel Duchamp, to Michael McClure and William S. Burroughs, to Dennis Hopper and Dean Stockwell, to the Rolling Stones, Neil Young, and Toni Basil. TOSH takes an unflinching look at the triumphs and tragedies of his unusual upbringing by an artistic genius with all-too-human frailties, against a backdrop that includes The T.A.M.I. Show, Sgt. Pepper's Lonely Hearts Club Band, Easy Rider, and more. With a preface by actress/writer Amber Tamblyn (daughter of Wallace's friend, actor Russ Tamblyn), TOSH is a self-portrait taken at the crossroads of popular culture and the avant-garde. The index of names included represents a who's who of midcentury American--and international--culture. Tosh Berman is a writer, poet, and publisher of TamTam Books. As a publisher, he focused on post-war French figures such as Boris Vian, Guy Debord, Serge Gainsbourg and French gangster Jacques Mesrine, as well as publishing Sparks (Ron Mael & Russell Mael) and Lun*na Menoh. His previous book Sparks-Tastic (2013) is a combination of travel journal and thoughts on the band Sparks. His book of poems The Plum in Mr. Blum's Pudding (2014) came out through Penny-Ante Editions. He authored the introduction to Wallace Berman: American Aleph from the Michael Kohn Gallery in 2016.